For people who aren’t offered insurance at work and don’t qualify for Medicaid or Medicare, their option for health coverage is called the “individual health insurance market.” The Health Insurance Marketplace set up by the Affordable Care Act (ACA) is part of the individual market along with plans that people buy on their own outside of the Marketplace. The individual market is critical: many self-employed or contract workers, small business employees, part-time workers, low-wage workers, and early retirees rely on it as their source of coverage. In 2016, about 1.6 million non-elderly Texans had individual market coverage, and about half of them paid the full cost of coverage because they do not qualify for ACA premium subsidies. 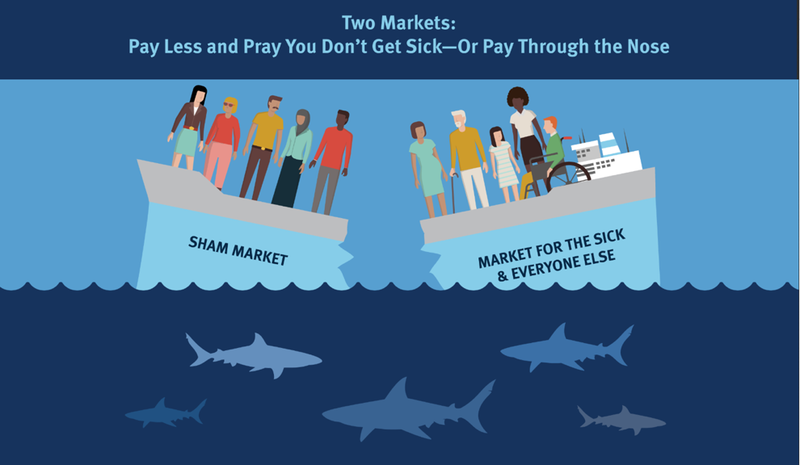 Today, under the ACA, this market for individual insurance consists of one pool which shares risk between more and less healthy consumers. People in less than perfect health – those with pre-existing conditions, children with complex needs, pregnant women, and older adults – are protected against discrimination. Insurance companies can’t turn them down or charge more because of their health status and coverage of Essential Health Benefits is guaranteed for everyone. Short-Term Health Plans. These inexpensive plans do not have to comply with ACA consumer protections. They can deny coverage to people with pre-existing conditions, impose arbitrary lifetime caps, and have skimpy benefits that exclude prescription drugs, maternity care, and treatment of mental health and substance use disorders. Association Health Plans. These plans do not have to comply with many ACA protections, like Essential Health Benefits coverage. These plans have a long history of fraud, scams, and insolvency. Young and healthy people who are lured into cut-rate, substandard plans will find that their coverage is sorely lacking and they are exposed to huge financial risk if they develop health problems. Older adults, women, and people in less-than-perfect health will be left behind in a residual individual market with skyrocketing premiums and, possibly, geographic areas without any comprehensive plans available. CPPP submitted comments in opposition to both federal rule proposals: Short-term plan rule comments and association health plan rule comments. States have several tools available to increase market stability, including state-level limits on short-term health plans and “1332 State Innovation Waivers” that use federal funding to offsets risk and reduce premiums in the individual market. Texas policymakers should work to maintain market stability in a manner that protects consumers’ access to comprehensive and affordable coverage – 1.6 million Texans are counting on them. Sign up for our email list to get updates on these proposed rules and for ways that you can take action and help push back against them.